Manage lots of WordPress websites? Want them all to run faster? But no time to optimize them all? We’ve made it so that you can control WP-Optimize from UpdraftCentral in order to make streamlining all of your website databases even easier and more effortless! So you can now optimise all your websites all in one place at one time. Here’s a preview of what it looks like. We’re continually developing UpdraftCentral, and we’re committed to it being the world’s most advanced and easy WordPress multiple site backup, update and management tool. To sign up to UpdraftCentral, or get a free trial, find out more here. 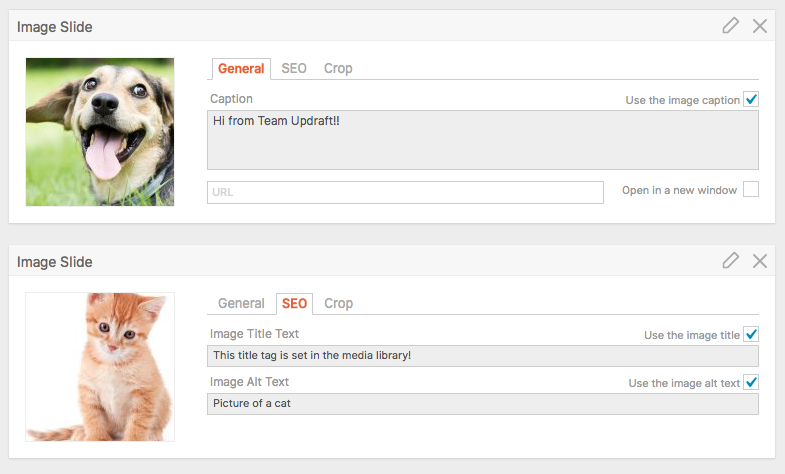 The post UpdraftCentral is now compatible with WP-Optimize appeared first on UpdraftPlus. UpdraftPlus – Backup, restore and migration plugin for WordPress. We just released version 3.7.0 of MetaSlider! This news arrives the day MetaSlider ticks over to more than 900k active installs – we’re grateful to all our users. The main feature of this release is the ability to inherit the caption, alt, and title attributes directly from the WordPress media library. This means that any changes made to images in the WordPress media library will atomically be reflected in your slideshows. This allows you to manage your meta information in one place. Newly-added checkboxes allow you inherit or override the captions and SEO information on the MetaSlider. Further, you can easily override the setting and create a new unique caption, title tag or alt text easily without worry of it being overwritten. This gives you complete control and flexibility to build the perfect SEO strategy for your website using the MetaSlider. Additionally, all your previous slideshows will not be affected by this upgrade, so no need to worry about any changes to your existing slideshows. The post MetaSlider adds SEO tools to better manage your website (MetaSlider 3.7.0) appeared first on UpdraftPlus. UpdraftPlus – Backup, restore and migration plugin for WordPress. The post New Command-Line Feature for WP-Optimize appeared first on UpdraftPlus. UpdraftPlus – Backup, restore and migration plugin for WordPress. WP-Optimize has a brand new Premium version! With spring around the corner, we thought we’d cheer you up with exciting news: the launch of our WP-Optimize Premium version. It’s hard to believe it was over a year ago that we acquired WP-Optimize, WordPress’ most popular clean-up plugin. We love everything it’s about: how it optimizes databases, gets rid of all useless and unwanted data to make WP websites everywhere neater, faster and more efficient. We also rate its incredible ease of use, and how it automates what would otherwise require a great deal of time, effort, and technical knowledge. But good as it is, our UpdraftPlus team always saw its potential to become even better. So these past months, we’ve been working hard to create a whole load of extra features, which we’ve crammed into the ultimate version: WP-Optimize Premium. … plus, we’re planning even more. Watch this space! If you already use WP-Optimize, we know you’re going to absolutely love this Premium version! It’s available for purchase at 20% off today. Simply go here, and use coupon launch20off voucher code at the checkout. The promo will end on 16 March 2018. The post WP-Optimize has a brand new Premium version! appeared first on UpdraftPlus. UpdraftPlus – Backup, restore and migration plugin for WordPress. This is the sad story of James Howells, who had 7,500 bitcoins stored on a computer hard drive that’s now beneath 200,000 tons of rubbish at his local tip in Newport, South Wales – just down the road from UpdraftPlus’s main office. Howells, who works in IT, managed to mine 7,500 bitcoins using an old laptop back in 2009 when you didn’t need specialised hardware. When the laptop broke, he sold it off in parts on eBay, keeping the hard drive safe in a draw in case bitcoin ever took off. After 3 years, he had completely forgotten about his bitcoin hoard and threw out the hard drive during a clear out. “You know when you put something in the bin, and in your head, say to yourself ‘that’s a bad idea’? I really did have that,” Howells, said. But for a while, he didn’t give it much thought. “I hadn’t kept up on Bitcoin, I’d been distracted. I’d had a couple of kids since then, I’d been doing the house up, and forgot about it until it was in the news again.” Even then, his bitcoins were worth millions. But since the market price of the digital currency has skyrocketed in recent months, his pile is now worth over $120 million. Naturally, Howells has done his best to get the hard drive back. But as he points out, “digging up a landfill is not as easy as just digging a hole in the ground.” Not only would it require excavation on a massive scale (involving lots of specialist machinery), but it would also involve all the dirty, dangerous excavated waste having to be stored, treated and searched through with a fine toothcomb. The costs would run into the millions, and the environmental impact would be enormous. And even given such an effort, there’s very little chance of actually locating the little hard drive. If by some miracle it could be located, it would probably be corroded by the landfill leachates and gases. You never know, one day you might thank us for saving you a fortune. The post Man fails to backup Bitcoin now worth $120 million. This is what he did… appeared first on UpdraftPlus. UpdraftPlus – Backup, restore and migration plugin for WordPress.